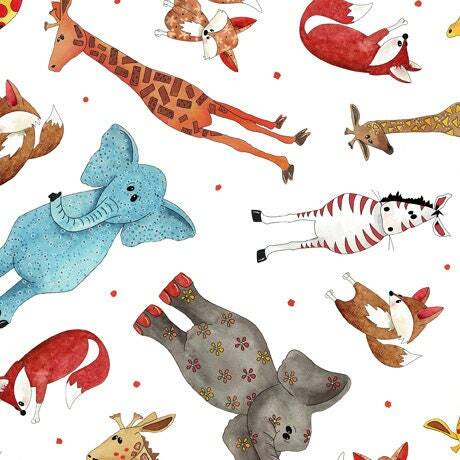 Wild and whimsical, this collection by ©Desiree's Designs is truly adorable. 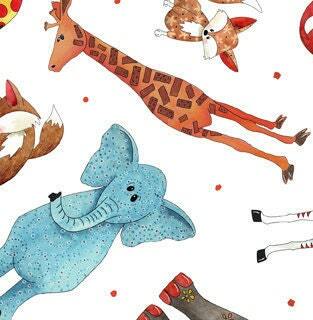 Playful prints with giraffes, elephants, zebra and fun foxes coordinate with an adorable panel waiting to be snuggled by your favorite little one. 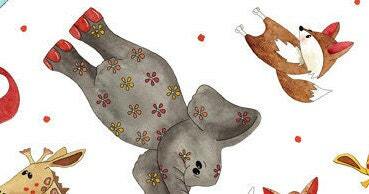 Pair this wonderful children't fabric design with the coordinating cotton panel to complete an absolutely adorable baby quilt. All fabrics at The Quilted Nursery Fabric Store is cut from directly from the bolt in continuous yardage. We now offer fractional yardage cuts for your quilting, sewing and crafting convenience. Same day shipping except for Sunday and holidays. Shipping overages are refunded on shipment of fabric. So soft and cute. Will enjoy quilting this for a friends baby. Repeat buyer, lovely fabrics at great prices, and fast shipping! Love the bag they came in, and thank you for the lovely card! !